Zebra herds create a striking image as their stripes clash against and mingle with each other, making it hard to pick one zebra out of the crowd. The herd will contain animals of various sizes, from the smallest newborn foal to the largest, most powerful stallion. The females tend to fall in the middle size-wise. Zebra stallions are the protectors of the herd, watching over a harem of five to six females, usually. These family groups join with others to create a herd, but each stallion stands watch over his ladies and children to protect them from danger and other stallions who might get the idea to steal a few of them. They often fight each other for rights to certain females, so the biggest and strongest usually win. This leads to the males being larger than the females, averaging 700 pounds but topping out at 990 pounds. Smaller than the males, females are the nurturers of the herd and take care of each other as well as the foals. It's common to see females grooming each other or standing neck to neck with another female in the harem. Young zebras often stay with their mothers for two to three years, hanging around even after their mothers have new foals. Female zebras still have a powerful weight advantage over most predators, staying barely above 400 pounds on the low end and averaging 570 pounds. When new zebras are born, they typically weight about 65 pounds. A foal can run with his mother within a few hours of his birth, but zebras typically aren't fully weaned until they're about 11 months old. Most zebras reach their full height of 3 1/2 to 5 feet at the shoulder at around age 2, but they fill out for two to three years to reach their maximum weights. It normally takes three to four years for a female to reach her maximum weight, not counting her weight when she's pregnant. It can take males five to six years to reach their full weight. Males and females don't typically start reproducing until they've reach their adult weight. Females are usually ready to bear young at age 3 or 4, but males don't start trying to reproduce until age 5 or 6. Zebras can live for 25 to 30 years. 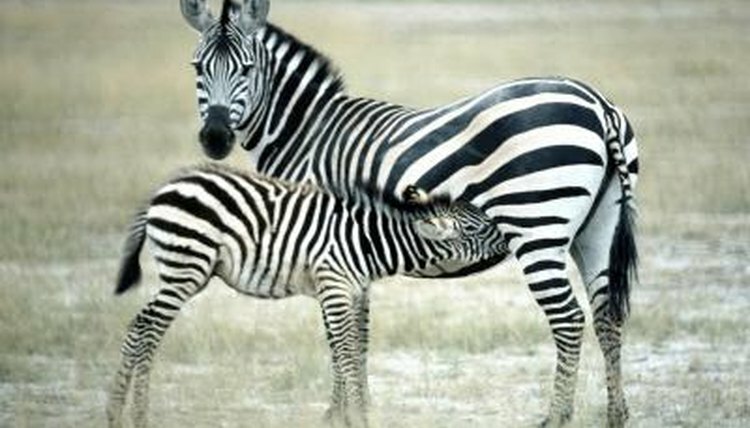 Can a Horse & Zebra Reproduce?